The newest stainless-steel spoons designed for feeding babies come in different sizes for Infant or Baby. Choosing the appropriate size depends on each baby's needs and preferences. Infant spoons are perfect for feeding younger babies and giving the parent a comfortable grip, as it is long enough not to fall into the meal bowl. Baby spoons are shorter and wider, which makes them ideal for feeding older babies. The material used for both size versions is 18/8 stainless steel designed for eating. The stainless steel is polished and very durable, as the spoon cannot be bent or damaged during usage. 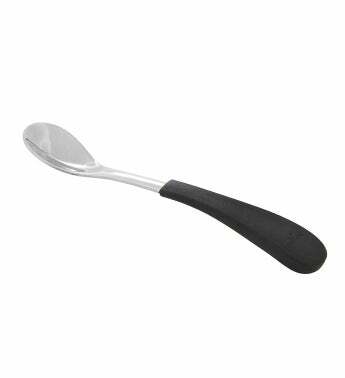 The steel is reinforced and thicker compared to other metal spoons out there. Our infant and baby spoons are BPA Free, BPS Free, Lead Free and Phthalate Free. Moreover, the spoons come with a silicone handle, which transforms them in a safer utensil for eating. This is a useful feature for parents who adopt baby lead weaning. If the kids feed themselves while using this spoon, the chance of injury is visibly reduced. The silicone is free of any substance that may interfere with a healthy meal time. The spoons come in packs of two. The available colors are green, blue, pink and black. Avanchy Stainless Steel Infant Spoons 2 Pack. The newest stainless-steel spoons designed for feeding babies come in different sizes for Infant or Baby.